It's Stephanie Muzzulin here with you today to share a little creation. This week Unity launched a membership called Uniquely Unity you can check out all the info on it here. I personally love getting things monthly at my doorstep it is so fun looking forward to it each month!!! 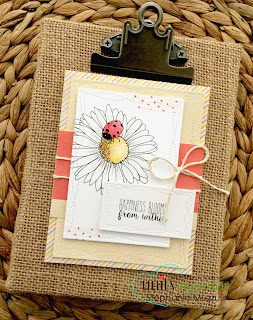 Anyways here is my card using this month's kit love the flower with the ladybug so cute and this kit comes with a couple of sentiments as well!! I colored my image with my colored pencils(prisma) and the pattern paper is an older collection from Authentique.